Fifty years in the future, a war is being fought between the Polity and the Union. A Polity pilot named Julian Chase turns the tide of a key battle, but at a great cost, leaving his grieving partner behind. But a few years later, Chase mysteriously re-emerges, leaving his old team shocked. He is the test subject for a new technology—a technology that may well break down the machine-man barrier and change the balance of power in an instant. With his powerful Holon mecha and a new team of neurologically-connected expert pilots, does Chase have what it takes to drive the Union back and turn the tide of the war? Many fans of animation and nerd culture around the world revere Rooster Teeth , the Austin-based production studio that began a slow climb to fame back in 2003 with Red vs. Blue, a series of online animated shorts created with the Halo engine about two platoons of bored soldiers skirmishing in a box canyon. Sometimes surprisingly bleak or thoughtful, but usually mischievous and silly, these simple 5-minute (give or take) shorts built the foundation of a robust entertainment company, and allowed them to stretch out and experiment, more and more, with the medium of animation. 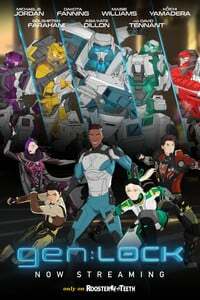 In the wake of RT's global smash hit RWBY , an anime-influenced 3DCG series that mixes a subversive sense of humor and cinematic action with magical girl business, Rooster Teeth have taken another ambitious step forward, presenting gen:LOCK , a flashy mecha action series anchored by a legit movie star in Michael B. Jordan . gen:LOCK may not be Japanese animation, but it's clearly inspired by the medium and created by ardent fans of anime, including Jordan himself. In my book, that makes it worth a look. As the curtain rises on gen:LOCK , we meet Julian Chase, a pilot in the Polity state's Vanguard military deployment. The Polity, seemingly a successor to the US, Canada, and Mexico, is locked in conflict with the Union, an encroaching autocratic regime that appears poised to invade North America. Chase takes a break from duty to introduce his girlfriend Miranda (also a pilot, but of one of the Vanguard's ground-based mechs) to his family, but the fun is cut short by that very invasion, and in the ensuing Battle of New York, we learn some ominous things about the Union. First of all, their war machines have a clear technological edge over the Polity; the ground-based units, with insect-like multiple limbs, are both larger and faster than the Union's stomping Battletech-esque suits. The Union also holds an interesting battlefield trump card in weaponized nanomachines, ‘gray goo’ that's programmed to disable or kill anyone not ready to cooperate with their forces. Chase appears to turn the tide of the battle and delay the nanomachines from overrunning the city, allowing a large-scale evacuation, but at the cost of his life. Four years later, Miranda and her team seem to have moved on from the loss of their ace pilot, but they're locked in a grinding slog against the Union, who've been steadily pushing Vanguard forces westward since taking NYC. Just when things are looking up for the Polity with the completion of the Anvil, a high-tech research and defense base with a main cannon big enough to provide direct-fire support to much of the Midwest, the Union attacks. Once again, the Polity are only barely holding the line—but then they're saved by a towering, fantastically agile mecha that turns the tide of the battle in seconds. Soon, they meet the pilot: Julian Chase, dead four years. Chase isn't alive, exactly, but he's been kept around, in secret, by other means. His circumstances, along with a new technology dubbed GenLock (no jokes about old subtitling systems, please! ), allow the pilot to enjoy a kind of Cartesian duality – his consciousness can completely unmoor itself from his wrecked body, and upload to a Holon, one of the aforementioned towering, cutting-edge mecha suits. Dr. Weller, a gregarious and charming mad scientist, tries to explain that the GenLock program is the next evolution of mankind; meanwhile, the Anvil's stern commanding officer is obliged to keep reminding him that it was actually developed as a weapons system. Then, we meet the rest of the pilots, Chase's new squadmates: a fighter pilot, a covert operations agent, a tank driver, and a cool teen computer hacker. You'd think the hacker would be out of place with the combat veterans, but it somehow works—there's something satisfyingly Snow Crash about it. These characters almost immediately come off as a bit atypical. They're not cut from the classic Gatchaman mold of the gallant hero, his bad-boy rival, the girl, the kid, and the fat guy; there's something surprising about each of them. Yasamin, the fighter pilot, is from a dissident family, but she still seems the most conventional of the group, a gritty, no-nonsense fighter. Valentina, the spy, is appropriately taciturn, and carries an interesting little secret about their personality that emerges when the team is a little more comfortable together. Cammy, the teen hacker, promptly starts digging into the software of their new robots to gain an edge that way. Kazu, the tank pilot-turned-cook, is a fists-first-questions-later kinda guy, but also a moody musician, and he doesn't actually speak English. He's portrayed by veteran seiyuu Kōichi Yamadera , and it's nice that the producers didn't force him to stumble through the show speaking English. He sticks to Japanese, in his inimitably smoky “ I've Seen It All , and it all exhausts me” delivery, and everyone simply understands him. Shades of Gunhed! Having a crew of living, able-bodied pilots controlling the Holons carries risks and rewards. You can upload your consciousness to the robot, but it'll leave your body in a coma-like state back at the base. If things go sideways, your mind could be trapped on board the Holon! Lots of pilots age out of the program, which makes the pool of potential pilots small and turbulent. And since Holon pilots all upload their minds to a shared network, they can communicate instantaneously and even share sensory data—but there are short, Ultraman-like limitations on how long they can employ such methods. The pilots start to learn their roles, but soon enough, their technology is matched by the Union, and they find themselves facing off against a mysterious enemy mecha . That Union mecha suddenly starts speaking to Chase and his team with a ghostly, staticky voice—Chase's own voice. Queasily ambiguous identity, the whole “What if you aren't really you anymore?” question, lays the foundation for some of the best modern science fiction, from Al Bester's The Demolished Man, to Source Code, to Blade Runner, to that one Doctor Who episode with the creepy “Are you my mummy?” kid in the gas mask. Here, it gives a plot curiously bereft of obvious enemies a crucial twist. It turns out that when the GenLock program was in development, Dr. Weller made a perfect digital copy of Chase's neurological structure-- a backup copy of his 'ghost,' if you will. Well, what's to prevent someone from swiping that backup and putting it in their own mech? What if Chase himself, or at least the Chase who fights for the Polity, is the backup, and the real Chase is fighting for the Union? What if neither of the Chases facing off in this conflict are the real Julian Chase? Before I dig into the ups and downs of gen:LOCK 's plot and structure, I want to talk about the show's cast— Rooster Teeth 's shows have always depended on the casual charisma of its actors, who frequently double as the productions' writers, producers, and creative staff. Here, they change things up a little; not only is the series headlined by Creed and Black Panther star Michael B. Jordan as Chase, it also boasts the likes of Game of Thrones' Maisie Williams as teen hacker Cammy, international breakout star Golshifteh Farahani as Yasamin, Billions actor Asia Kate Dillion as Val, Dakota Fanning as Miranda, and Broadchurch and Doctor Who star David Tennant as Dr. Weller. Using a large coterie of internationally-known, well-liked screen actors is a power move, and one that earns credibility for Rooster Teeth . A bigger power move is fearlessly mixing these big-deal actors in with their own voiceover and creative talent, like Miles Luna , who plays the Anvil's chief mechanic Migas, and series creator Gray Haddock , who takes a supporting role as the grizzled old-type mech captain. The cast is generally quite good, though the standouts are supporting performers like Tennant, who's been voice acting since 1993 and has the chops to prove it, and an impressively unrecognizable Monica Rial as the dour, weary Anvil commanding officer Colonel Marin. Visually, gen:LOCK is more of a mixed bag. The characters look good and move well, and are notably more distinctive than RWBY 's heroes and villains—chalk that up to the series being built out in Maya with 3dsMax, rather than Poser. (If you ask me, as an animation tool, Poser makes a great toy.) The Holons also look cool—they have a strong silhouette, which every giant robot needs, and their bright, multicolored squad scheme brings the likes of Virtual ON! To mind. They look especially interesting once the pilots start customizing them, such that I already want a plastic model kit of Kazu's bull-horned, sword-wielding Holon to assemble. The way the Holons and other vehicles move, however, still needs some work—much like with RWBY , there's often a lack of impact, a sense of weightlessness, when the action really gets going. There's too much gliding! The art and animation team also struggle to make the show's scenery stand out—a lot of background scenery sports a procedurally-developed look that brings the earlier versions of Bryce to mind. During battle scenes, elements like terrain and object damage, as well as smoke and explosion effects, just aren't convincing. This is likely a result of Rooster Teeth keeping a lot of their production talent in-house, rather than outsourcing chunks of the work to experts, like you'd see in Japanese productions. It's a good start, but they've got some ground to make up to stand toe-to-toe with something on the level of Land of the Lustrous . That said, there's more than enough about gen:LOCK to keep the viewer engaged, from its fresh cast of characters, to the Holons, to the central mystery of Julian Chase's existence and what the GenLock technology might mean for both the Polity and the rest of the human race. These opening eight episodes are about meeting the team, establishing their relationships with each other, and setting up an initial fight. Aside from some rough visuals, the biggest criticism I've got for gen:LOCK is that it struggles to establish a truly efficacious conflict—the ‘shadow’ Chase on the other side is intriguing, but doesn't make for a truly compelling antagonist. What we're left with is a series that's strong on characterization, but has some trouble with the setting. Despite that, this show trades on an intangible ‘cool’ factor that very often bridges its gaps. I look at gen:LOCK and see a statement of intent and ambition. If a potential season two can tease out a story that matches the ambition of season 1's characters and core concept, this will be a very good show indeed. Until then, gen:LOCK feels just a little bit like a prototype. + A brisk, purposeful mecha anime with exciting stars and intriguing science fiction concepts. − CG animation is sometimes a bit basic and halting; story could really use some more development.